Last edited by BobLoblaw; April 13th, 2018 at 12:22 PM. Capone breathes a sigh of relief finally. Yeah Wadatsumi swapping the ship is pretty far fetched but the framing of the chapter was that the Sun Pirates were doing everything they could to help the strawhats. Made it work for me. On its own, this chapter was pretty enjoyable to read… if not for a little sin. I hate what Oda has done with the now fake cliffhanger from last chapter. Although I admit that this solution isn’t the most incoherent between the many theories that people formulated for Sunny’s shipwreck being an illusion, this just feels deceitful nonetheless. Btw, just to clarify something, I didn’t believe the Sunny was actually destroyed beyond repair. My assumption was that the damage was real, but it would be repaired by Franky in Wano after the escape, whichever the means for such. So my dissatisfaction is not with Sunny’s survival. The problem lies elsewhere. Chapter 900 had a clear meaning to me: a beautiful juxtaposition of Big Mom’s euphoria while the Strawhats’ alliance was being oppressed by her forces, which culminated in the final climax with Sunny’s bombardment (even if nobody would actually die, of course). The flag floating on the sea had the symbolic meaning of defeat. The narrative had the tone of despair. That was awesome and enough for me. But is it the same now that nothing actually happened to the Sunny? Not that I think chapter 900 was filler, since it had progression and some consequences, but it loses half the reason that justifies its artistic tone and appeal. It’s not completely void of its meaning now or something that extreme, of course, but it loses punch in retrospect. A bitter taste, not sweet, milky and rich. Definitely RISKY tough, lol. Despite not being technically invalid that Wadatsumi had switched the ships, it’s hard to understand from whose perspective this happened without the readers having to see the truth. It’s not like the illustration came from the perspective of a particular character that was fooled (therefore also fooling the readers). On the contrary, the perspective was neutral, narrated from the third person, with two different takes from opposite sides. Then we have the artistic choice of showing us the flag floating in the sea. All I can understand is that we’re watching things from the author’s perspective, telling us the facts from an impersonal and dramatic perspective…. that just happened to be a fraud for artistic reasons, I guess. This was not the first time Oda has done something like this and it wouldn’t be as bad if not for the excellence of chapter 900. It’s like a personal highlight of the whole series being diminished. That’s a pity. Only that. Otherwise I wouldn’t be so frustrated by this kind of trickery. Last edited by theackwardstation; April 12th, 2018 at 11:01 PM. The art helped a lot, I liked the full chapter. So the Straw Hats escape within like 1-2 chapters imo, the unresolved stuff is put on hold til Elbaf where it's more appropriate to tie up. I can still see a switch to Reverie after this chapter. To be clear, by unresolved stuff, I think we're still getting more with Streusen, Caramel, etc. Glad to see Bege is on his way out, even with his ship destroyed. I will say that the Jimbei situation played out a bit better than I thought it was going to from the spoilers. But at the same time, the Jimbei fan in me is still upset. While the Strawhats are pretty much guaranteed a stress free escape now, there is still the resolution of Pekoms' betrayal, Germa's fate, and Pudding's words to Sanji to still be resolved. Big Mom technically did faint, but not for long. She probably would have done the same thing even if the cake wasn't as good to be honest. With the actual chapter out, Jinbei's deathflag doesn't really feel changed for the worse. Big Mom News Morgans loves Luffy more than Big Mom ahaha. I still dig the cover story more tho. I doubt it's gonna be stress free. Big Mom is on her way now, and I wouldn't be surprised, seeing how this arc has gone so far, that she makes up the distance and somehow one shots the fishmen, getting to the Sunny before they can escape. This could potentially lead to another cliffhanger chapter ending, which extends this arc again. Regarding Jimbe’s situation, I’m pretty okay with the current developments and the whole strife was well written. My conviction is that Jimbe is already a crewmember and this fact can’t be more explicit than Luffy’s words in this chapter calling himself Jimbe’s captain. If Jimbe’s not tagging along right now, it’s because there’re plot reasons, for good of bad, so we just have to hope that the pay off will be exciting. My theory is that Jimbe will join the crew a little after the Reverie. Why? Just hear me out. One of the Reverie’s plotlines revolves around Neptune asking to the World Government for his people to move to an island in the sea surface. Obviously, something will go wrong and the fishmens’ hope will be shread into smithereens. Then, aware of this fact by the newspapers, Jimbe will arrive at Wano and he’ll ask help from his captain, claiming his dream of protecting his race and giving them better days, a task worth of the Pirate King. Great chapter, the ship switch is kinda cheap way to resolve the cliffhanger but the overall chapter is great. BUT GODAMMIT JINBE!! HOW MANY TIMES ARE YOU GOING TO TEASE ME UNTIL YOU ACTUALLY JOIN?! Is this the first time we've seen Moscato since the start of the arc? I'm surprised BM is back up so soon. I thought it would have been plausible for her to actually be out of commission for the rest of the arc. Looking back at Chapter 900, I'm assuming Luffy was just pointing at the Chanter. No idea how blind the BM Pirates are to not see the ships being switched in real time. This sours 900 to some extent. So will BM reach them, or does she just have the chance to shout something to them next chapter...otherwise this arc seems over. Good chapter. I'm fine with that explanation and the interaction between Luffy and Jinbe was great. 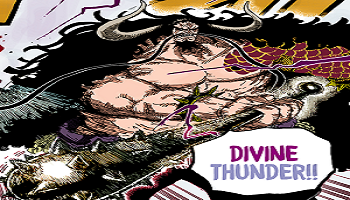 Jinbe leaving his former crew behind would have been out of character. Speaking of that, I feel that Sanji's lack of screentime is a bit odd. Unless something happens next week that will make the Vinsmoke escape seem realistic, it would be odd to see Sanji being fine leaving his family behind in that particular situation. Not expecting him to stay back of course but at least show us that he's worried about them. Besides that, I think that it was a weirdly random way to confirm that she didn't really kill her son. It seemed obvious that it was possible to put back extracted soul on someone but I didn't expect to have confirmation like that. I felt that the chapter read a LOT better than the spoilers made it sound. Still though, I feel like something was missing this chapter. My biggest gripe is the fact that the cake only seemed to strengthen Big Mom, which seems to, in my opinion, reduce Sanji's impact this arc. However, part of me likes the fact that she simply tanked his taste, because she is an Emperor after all. I don't want BM, or Kaido, or BB to be nerfed. I like how Oda shows that they are truly powerful beings that will take everything to beat. This makes me feel conflicted, as I wanted the cake to do something to Big Mom, yet it seemed to do nothing. All in all, I feel like with the exception of this chapter, WCI has been great. Seeing how this arc has gone, I would not be surprised if she reaches them. Now it all depends on Pudding. If at all, only Pudding can stop BM right now from hunting Luffy.